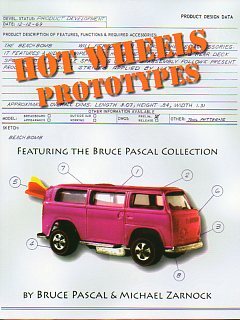 HOT WHEELS PROTOTYPES is an insightful new book for all ages. Readers will enjoy the narrative history of Hot Wheels prototypes from the moment Mattel founder, Elliot Handler first said, "Why not we try? ", to the research and development department's lively competition to bring the coolest cars to the table! Adults and kids alike will love the beautiful, never before seen photos of Hot Wheels cars in the beginning, middle, and finished stages. Even the serious Hot Wheels collector will be fascinated by the rare interviews and never before seen internal photos and documentation. Hot Wheels experts, Bruce Pascal and Mike Zarnock have pooled their knowledge to showcase and explain the history of each prototype car in Bruce's amazing collection. However, their real intent is to inspire the reader to cherish Hot Wheels, whether they're just getting started or now want to add the word: prototype to their existing collection!